Cedar Rapids – June 25, 2015 – Timothy Hankewich, Music Director of Orchestra Iowa, announced today at the 2015 Annual Board Meeting the appointment of Dawn Gingrich as their next concertmaster. Gingrich’s appointment marks the successful conclusion of a year-long national search. She succeeds Luke Witchger who left Orchestra Iowa in 2013 to finish his education at the Juilliard School in New York, New York. “We are excited to welcome Dawn Gingrich to Orchestra Iowa,” said Timothy Hankewich. “Ms. Gingrich has the experience, skill set and personality to make a great concertmaster for our musicians and an outstanding representative to the community. We are eager for her to become immersed in the Orchestra Iowa School, our educational programming and the greater Eastern Iowa Cultural Corridor”. Ms. Gingrich is an accomplished soloist, chamber and orchestral musician. Her experience as a soloist has taken her to Paris, Barcelona, Germany, New York, Chicago, Boston, Santa Barbara, and Baltimore. Her accomplishments as an orchestra musician have had her serve as Guest Concertmaster for the Music Academy of the West Festival Orchestra, the Dubuque Symphony Orchestra and Symphony Orchestra Academy of the Pacific. Ms. Gingrich has earned top prizes at the Fischoff National Chamber Music Competition, Eastern Connecticut Symphony Orchestra Young Artist Competition, Skokie Valley Symphony Concerto Competition, and the Music Academy of the West Concerto Competition. In 2008 Ms. Gingrich released a recording: Time Beyond Me, an album recorded in collaboration with Boston Trio pianist Heng-Jin Park and Dawn’s father, Chicago Symphony Orchestra associate principal French hornist Daniel Gingrich. The record features the Brahms Horn Trio as well works for unaccompanied violin by J. S. Bach. “I am looking forward to an exciting 2015/2016 season of symphonic masterworks, chamber performances, and educational outreach concerts throughout Iowa,” said Dawn Gingrich. “I really enjoyed my visits to Iowa this last season and am eager to continue collaborating with [Music Director] Timothy Hankewich, the rest of the Orchestra Iowa musicians and staff”. 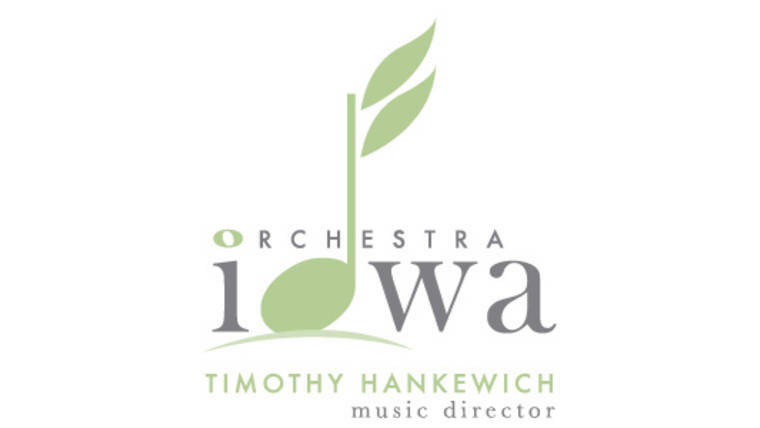 Orchestra Iowa is recognized as the state’s premier symphony orchestra, under the direction Timothy Hankewich, now celebrating his tenth year as Music Director. Founded in 1921, the mission of Orchestra Iowa is “to foster enjoyment of, and support for fine symphonic music through quality performances, education, and community involvement’” Its 65 professional musicians perform more than 198 public performances throughout the year, many of which can be heard on Iowa Public Radio and seen on Iowa Public Television. Orchestra Iowa showcases its artistic excellence each season through an accomplished array of classical, ballet, opera, popular and chamber performances, in addition to extensive community education and involvement.